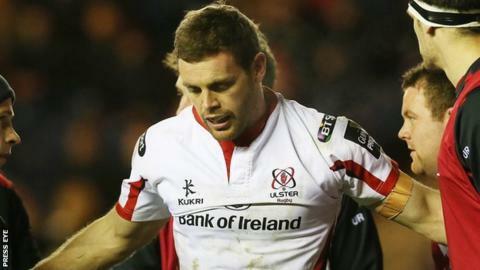 Darren Cave could be an injury doubt for Ulster's Pro12 match against Leinster in Belfast on 24 April, but Louis Ludik is expected to be fit. Centre Cave left the field with a tight hamstring in the latter stages of Ulster's 27-20 win over Connacht and is receiving ongoing treatment. Full-back Ludik sustained bruising to the ribs but should be ready for the Irish interprovincial derby in Belfast. Ulster lie third in the table, with three sets of fixtures remaining. A win over Matt O'Connor's outfit next week would ensure a play-off spot, but Ulster will be aiming for a top-two position which would guarantee them home advantage in the last four knockout stage. Neil Doak's side have won all their home Pro12 games at the Kingspan Stadium to date this season and are level on points with second-placed Munster and two behind pacesetters Glasgow. Should Cave fail to prove his fitness for the clash with Leinster, Stuart McCloskey or Luke Marshall, who returns from a ban, would be the likely candidates to occupy the inside centre berth. Leinster's defeat by the Dragons at Rodney Parade on Sunday left their hopes of making the semi-final play-offs hanging by a thread. The European Champions Cup semi-finalists are eight points adrift of the fourth-placed Ospreys and are now relying on other results going their way, as well as winning all their remaining games. Ulster will still be without long-term injury victims Andrew Trimble and Stuart Olding, plus suspended back-row forward Nick Williams. After facing Leinster, Munster are the visitors to Belfast on 9 May, with Ulster finishing their round of 'regular' fixtures with a trip to Glasgow on 16 May.